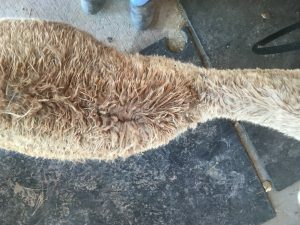 This case report describes an assessment of acupuncture to decrease pain and improve the quality of life of a juvenile alpaca with non-treatable spinal abnormalities. Acupuncture appears to have reduced the alpaca’s pain and increased its mobility. 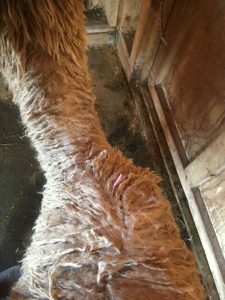 Overall the alpaca’s quality of life was considered to have improved following acupuncture treatment. 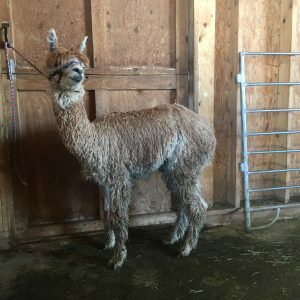 Jackson is an intact male alpaca born in August 2017. He was one of eight crias born into a herd of 20 alpacas that year. Routine health exams at six and eight months of age showed no physical abnormalities. At one year of age the owner noted that Jackson was smaller than the other similarly-aged crias in the herd. He had also started to adopt a ‘roach-back’ appearance (kyphosis). 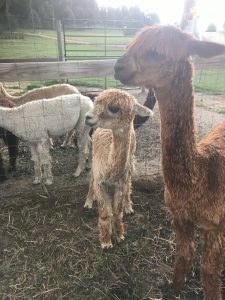 Jackson had always been a vocal cria, but the owner felt he was vocalizing more often when handled, as if in pain. The owner felt that Jackson was beginning to show additional signs of possible pain including isolating behavior, reluctance to rise and eating while lying down. His weight gain also plateaued. 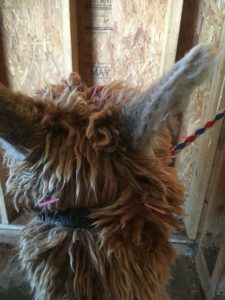 Jackson’s physical exam just prior to starting acupuncture treatments showed a bright, alert, responsive alpaca with a normal temperature, respiratory rate and heart rate. He was significantly smaller than the other crias his age but was in still in good body condition. He would rise and move away when approached but was not as fast as the other crias. He would raise his neck but preferred to keep it lower than normal and deviated to the right. His forelegs were straight but displaced to the left of his hindlimbs to the degree that they would no longer track in line with his hindlimbs. No abnormalities in the distal aspects of any limb were noted. His overall stance showed moderate kyphosis along his lumbosacral region. The tissue overlaying Jackson’s thoracic spine felt thick and flat. His thorax was barrel-shaped in appearance, more rounded and broad than what was typically found in alpacas his age. His costochonral junctions felt more prominent and he did act more painful when his spine was palpated. A myofascial exam showed bilateral restriction in the trapezius mm and latissimus dorsi mm, unilateral restriction of the right brachiocephalicus m, right infraspinatus m and right supraspinatus m. Tight bands were felt in those muscles bilaterally as well, most significantly on the right side. Little to no lateral flexion of the spine was noted in the cervicothoracic region. Reduced, but present, lateral flexion of the spine was found in the lumbosacral spine. The longissimus dorsi mm were moderately restricted bilaterally in that region as well. No cranial nerve or proprioceptive deficits were found. Overall Jackson did not like to be handled so physical contact and manipulation was kept to a minimum. Serum Vitamin D levels were within normal limits ruling out an ongoing Vitamin D deficiency (rickets). Radiographs of the long bones were normal suggesting that Vitamin D deficiency had not occurred previously. Radiographs of the cervicothoracic spine showed deviation of the C7-T2 vertebrae along both the horizontal and vertical axes. Further diagnostics were declined by the owner so other differential diagnoses could not be definitively ruled out. Since Jackson’s general good health and history did not resemble the signalment of previous cases of vertebral osteomyelitis that I have treated, that diagnosis was thought to be an unlikely. 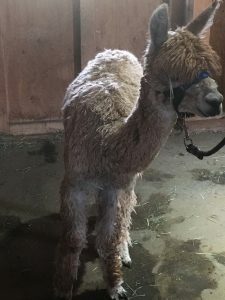 And, though scoliosis in alpacas has been documented due to parelaphostrongylosis, Jackson’s environment did not support the life cycle of Parelaphostrongylus tenuis ruling that out as a likely diagnosis. His normal appearance early in life also ruled out congenital causes for his problems. And, although not impossible, his young age made degenerative causes less probable as well. Given that Jackson is housed with multiple other male cria, trauma could never be ruled out completely. However, the insidious, chronic nature of his signs made me less suspicious of a single acute traumatic event. For all those reasons, including age of onset, a putative diagnosis of idiopathic scoliosis was made. Given the lack of treatment options for Jackson’s primary disease process, the owner wished to try acupuncture on Jackson to see if his pain could be controlled and his quality of life improved without daily medication, as that was difficult to administer to Jackson. If his quality of life could not be improved, euthanasia would be elected. My acupuncture approach therefore centered around trying to reduce Jackson’s pain by normalizing his areas of myofascia restriction and trigger points. Jackson did not like being handled so I knew the number of needles I could use each treatment would be limited. With his flighty disposition I chose to incorporate calming points when possible. In general my plan was to neuromodulate along his axial skeleton with more specific needling along his right shoulder and ventral neck region where the most tight bands could be felt. I was not attempting to correct the scoliosis but rather return some normal function to the local muscles ad thereby to provide relief where possible. For the initial treatments Seirin J 0.16 x 30 mm needles were used. As Jackson grew accustomed to the treatments Seirin J 0.18 x 30 mm and 0.23 x 30 mm needles were used. Jackson was treated six times. Four treatments were spaced one week apart. The time between the other two treatments was two or three weeks. The treatments lasted, on average, 20-25 minutes. Each treatment began with the placing of GV20 and LI16 (left and right) as a means of reducing anxiety and calming Jackson. Although Jackson vocalized throughout each of these treatments, once these points were placed he would often stand on a loose lead without moving until the entire treatment was finished. Points BL 10 (right and left), GV14, and BaiHui were placed next to create an axis of neuromodulation along the spine. Generally Jackson’s neck would begin to relax at this time and the ‘roach’ of his lumbar region would begin to reduce. If Jackson allowed it, BL21 and BL 26 were placed bilaterally to enhance relaxation of the thoracolumbar and lumbosacral muscles. On Jackson’s right hand side BL 11, BL 12, GB21, SI 12 and SI 11 were placed to reduce myofascial restriction throughout his entire right shoulder. Trigger points in the right C6-C7 region and pectoral mm were also needled if found on the pre-treatment exam. Similar points were attempted on the left side but, since the myofascia restriction was never as significant on the left hand side, placement of these points was determined by Jackson’s patience for treatment. Generally BL 11, GB 21 and SI 12 could be placed on the left. As Jackson became accustomed to his treatments an attempt was made to needle ST 36 bilaterally in order to increase parasympathomimetic effects, reduce inflammation and communicate along the entire spine to the nucleus tractus solitarius. Surprisingly, Jackson was very amenable to having this point needled. He would generally start to hyper-salivate as soon as the needles were placed. Both the owner and I felt that Jackson responded very well to acupuncture treatment. Although his primary spinal abnormality was not corrected, following treatment Jackson began to stand while eating, carry his head higher and more easily, run to keep up with his herd-mates. He also began gaining weight again. By the end of his final session Jackson would readily stretch his head over the stall door, something he had been reluctant to do at the onset of his treatments. He became more engaged with his herd-mates and will now often push them from the hay feeder as opposed to standing back to wait for the others to finish eating. Jackson may require further treatments in the future but for now his owner feels that his quality of life is such that he can become a healthy, happy pet/fiber animal and euthanasia is no longer being considered. Perhaps the most enlightening aspect of this case for me was how receptive an otherwise fearful, flight-driven species would respond to acupuncture. Alpacas do not in general like being touched, handled or petted; Jackson more so than most. For that reason palpation exams were kept to a minimum. However, once the acupuncture needles began to be placed, Jackson would stand quite still on a loose lead. No kicking or spitting ever occurred. That being said, I tried to keep my needle numbers to a minimum and touch Jackson as little as possible which limited the amount of points I could stimulate and the amount of manual therapy I could do during each session. Nonetheless, even with a limited application, Jackson tolerated and responded to the treatment very well. This case encourages me to continue to try acupuncture on animals and species that are considered more difficult handle. Johnson, Amy L., et al. 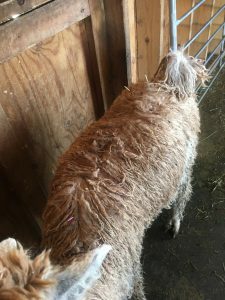 “Acquired Cervical Scoliosis Attributed To Parelaphostrongylus Tenuis infection in an Alpaca.” Journal of the American Veterinary Medical Association, vol. 229, no. 4, 2006, pp. 562–565. Vaughan, Jl, et al. “Congenital Caudal Vertebral Malformations in the Alpaca (Lama Pacos).” Australian Veterinary Journal, vol. 78, no. 6, 2000, pp. 412–415.